A Wine Guru's Favorite Piece of Furniture: Feel like a gourmet when you can display your favorite and expensive wine bottles along with your vintage or antique wine glasses. 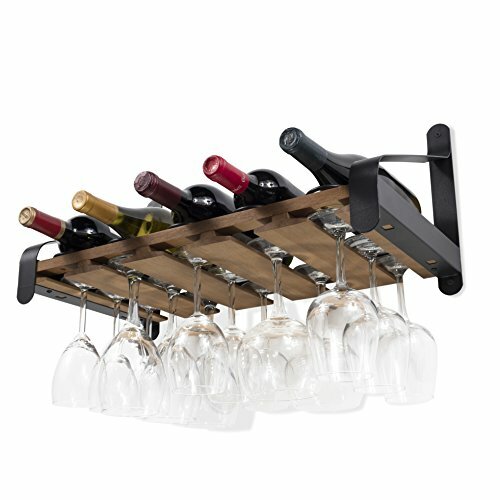 Each rack holds up to 5 bottles, you will enjoy hosting dinner parties and coming together with friends and family. Turn your empty wall space into a wall of art. Decorate your walls, tidy up your kitchen and turn your dining room into the ultimate gathering space. Free-Up Space and Get More as a Gift: With the help of the wine bottle holders and stemware racks you can free-up space in your liquor cabinet, kitchen cabinets and counter top. By ditching your bulky and heavy hutch, buffet, credenza or sideboard you can create more floor space to move around independently in your living space. The wine racks also make the perfect gift for a housewarming or Christmas. Make a loved one happy too, you can get it for any occasion or holiday. Product Measurements: L 22.15" D 11.30" H 10.25"